Home Learning Center Storage Lithium Ion Batteries: how are they used in solar systems? Lithium Ion Batteries: how are they used in solar systems? Lithium Ion Batteries are more and more used for solar energy battery banks due to their lightweight, few self-discharge, low maintenance and scalability. Batteries can be described as devices that are used to store electrochemical energy, which can be converted into electrical energy upon use. Batteries usually consist of an anode (also known as a negative terminal), cathode (also known as a positive terminal) and electrolyte (channel) in it. 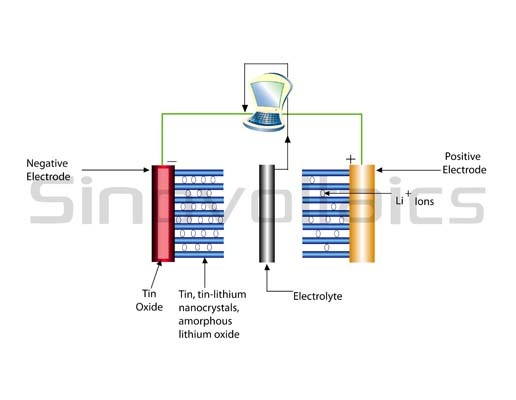 Ions move from cathode to anode in the vicinity of electrolyte in order to produce electric current (electricity). Batteries commonly can be classified into two types: Rechargeable and Non-Rechargeable. As the name suggests, Lithium Ion batteries make use of lithium ion (Li-Ion) in order to store electricity. The Anode is usually made up of Carbon (or any other similar nonmetal), Cathode is made of any metal oxide and electrolyte is generally made up of lithium salt solution. Li-ion moves from anode terminal to cathode terminal producing electricity by converting chemical energy to electrical energy. Lithium Ion batteries are the rechargeable type of batteries which are commonly used in telecommunication industry. Scalable, can be used as battery pack (many batteries connected in parallel) in order to serve high power applications or devices such as electric cars and electric wheelchairs. As nothing is perfect in this world, so are the Li-Ion batteries, which do have some limitations and disadvantages. Safe handling is required with Li-ion batteries because if they are overcharged, dropped or over / under heated, there are chances for combustion leading to fire. Aging: If not used for prolonged period of time, there are chances that batteries may drain. Once they have drained completely, Lithium Ion Batteries cannot be recharged and have to be discarded. Lithium Ion batteries can now be found across industries, from aviation, and telecommunications to IT and the car industry. Portable devices such as mobile phones, tablets, laptops, and electric cars are making use of Li-ion batteries or battery packs. With all the advantages stated above one can say that Li-ion batteries can be a good choice if handled with care and precautions. Despite of the disadvantages and limitation stated above, Li-ion batteries are now the most popular batteries all over the world.